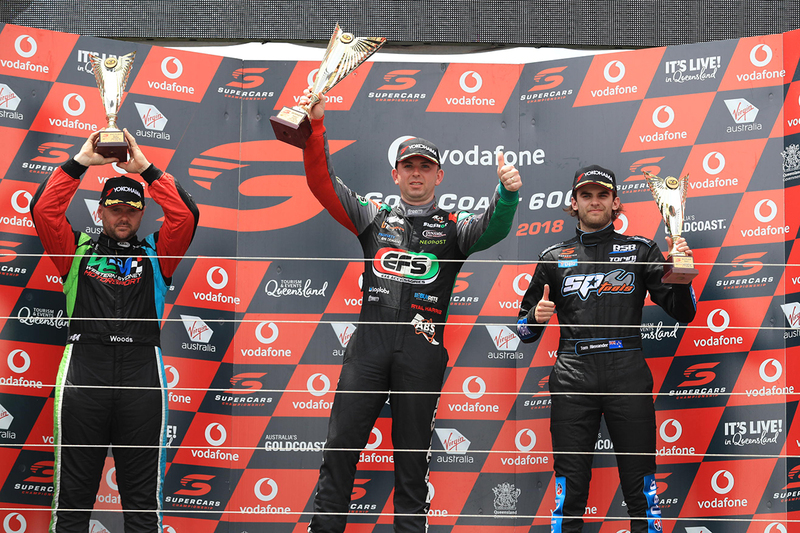 Craig Woods took out the Gold Coast ECB SuperUtes Series finale despite clouting the wall on the opening lap, while Ryal Harris secured the round honours. After finishing third and fifth in the opening two races, Woods completed his weekend with a victory, to be third for the event. The overall spoils went to title rival Harris, who won Race 1, finished second in Race 2 and settled for a conservative fourth in the final. From the rolling start, Woods got the jump on Tom Alexander and polesitter Harris. While he took the lead at the first chicane and ultimately led throughout, he tagged the Turn 12 wall later on the opening lap while fighting Alexander. 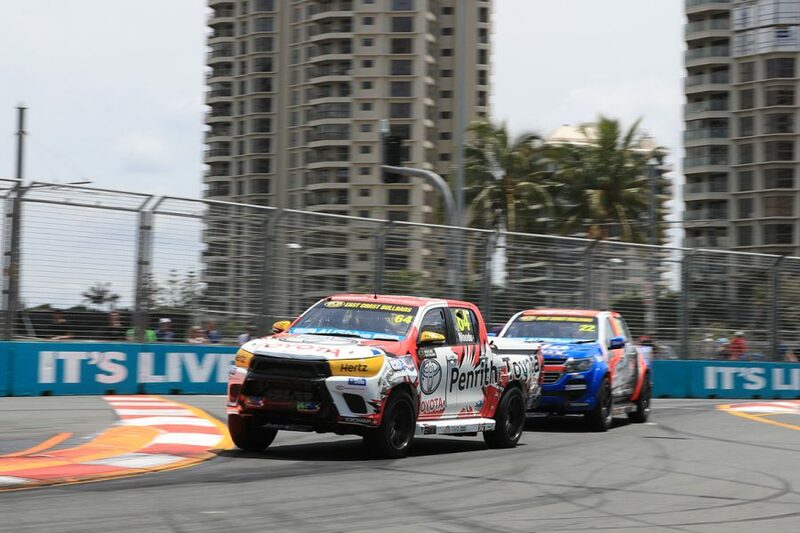 The Penrith Toyota was able to continue, Woods then withstanding a further challenge from the Holden driver, including the pair running side-by-side down the front straight on lap six. Woods skipped the chicane but brought it home. "We really needed that race win to carry some confidence into the final round at Newcastle and keep our title hopes alive," said Woods. "Our pace was good this weekend, but it took until the last race for us to get a result that reflected it." Alexander couldn't find a way past the Hilux of Woods, settling for next best in the SP Tools Holden Colorado, just 0.8585 seconds adrift. That left him second for the weekend, between Harris and Woods. "I was sitting behind Craig and had a couple of goes at getting past him - the contact bent my steering," Alexander explained. "I couldn’t quite get any of the moves done and at the end he got a gap, but second is still a good result after some of our recent struggles." 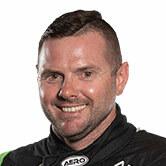 Woods' Western Sydney Motorsport team-mate Luke Van-Herwaarde finished the race third, to go with sixth in Race 1 and third in Race 2 on his SuperUtes debut. "That was was pretty exciting and I had a big side-my-side moment with Ryal heading into the Beach Chicane, but he showed respect and let me ahead," Van-Herwaarde added. "I’ve really enjoyed the SuperUte experience this weekend, and would love to be in one in the future." Harris was next in his EFS 4x4 Mazda, pressuring Van-Herwaarde but bringing it home in fourth. "I could see the guys were pretty keen to race hard, so I opted to stay out of trouble," Harris explained. "There were a couple of nervous moments, especially where I was side-by-side with Luke into the Beach Chicane, and I was definitely thinking about the championship. "I knew fourth was good enough for the round win, and I extended my championship lead. 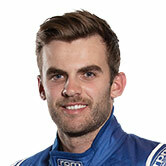 "Last year, Newcastle was costly [in V8 Utes] but I’ll be heading into it a lot more level-headed this time." Ben Walsh recovered from a late crash in the second leg to finish fifth, ahead of Christopher Formosa, Matthew MacKelden, Michael Sieders and Tomas Gasperak. Sieders had a Turn 11 tangle with Richard Mork on the opening lap that forced Mork's Ford into retirement. 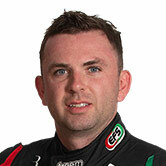 Race 2 winner Aaron Cameron was only 10th after battling engine problems. Team Triton driver Cameron Crick was the other non-finisher, clouting the tyre bundle at the Turn 3 chicane on the opening lap. Kim Jane was the only non-starter, missing all three races after engine problems were found on his Isuzu after ARMOR ALL Qualifying on Friday.